Bernard ‘Butch’ Judge, age 76 of Boone, died August 25, 2018 at the Westhaven Community. Following his wishes, Butch has been cremated. A Memorial Service will be Tuesday, August 28, 2018 at 10:30 a.m. at the Schroeder-Reimers Memorial Chapel at Sixth and Marshall, with Rev. Jim Bruch officiating. Burial of his cremains will be in the Sacred Heart Cemetery. Bernard Michael Judge, was born July 29, 1942 in Story County in Iowa, the son of Bernard A. and Madgel (Graham) Judge. 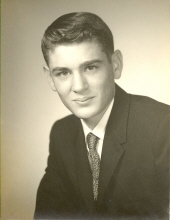 He graduated from Sacred Heart High School in Boone in 1960 and attended classes at Boone Junior College. In earlier years, Butch served the City of Boone as a Police Officer and was a member of the Iowa National Guard. He married Jackie Parrish and to this union, three children were born: Kim, Kelly, and Michael. They moved to Casper, Wyoming where Butch worked as a cowboy for 10 years on his uncle’s ranch, the Buzzard Ranch. He and Jackie divorced. He then worked as a Directional Driller for several oil drilling companies including, Wilson Downhole and Baker Hughes International. Butch married Rhonda Tharp and a son Jon was born. After the death of Rhonda in 2012, Butch moved back to Boone. In earlier years Butch enjoyed horseback riding and flying airplanes. After retirement, he enjoyed watching television, especially, NCIS: Los Angeles and the Food Network. He is preceded in death by his parents, his wife Rhonda, a son, Mike Judge, a sister, Kay Von Bank, and a brother John Judge, who died last April. Butch is survived by a son, Jon Judge of Boone; two daughters, Kim Singstad and husband, Greg of Ketchikan, Alaska and Kelly Sheriff and husband, Randall of Seattle, Washington; two sisters, Karen Anderson and husband Jerry of Boone and Kathleen Kohler and husband, Philip of Ankeny; several grandchildren; nieces and nephews. Friends may call at the Schroeder-Reimers Chapel on Tuesday, from 9:00 a.m. until service time. In memory of Butch, memorials may be directed to the family. To send flowers or a remembrance gift to the family of Bernard "Butch" Judge, please visit our Tribute Store. "Email Address" would like to share the life celebration of Bernard "Butch" Judge. Click on the "link" to go to share a favorite memory or leave a condolence message for the family.